I wonder how many of you share this problem with me. It doesnt matter how many tape measures I own, when I need one, they are nowhere to be seen. Every single time. I just cant find them when I need them. Then I may be tidying and find upwards of ten of the elusive little buggers. I will put them in really sensible places so next time, I will be sure to be able to find them when I need them. But by the time next time arrives, they have all just snaked their way into hiding again! Its driving me nuts. Hopefully this one will follow a better fate. 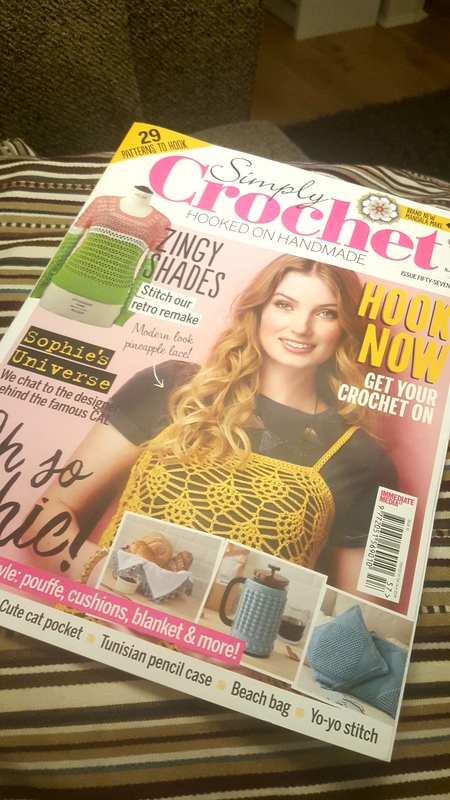 When I came home from the wedding on Friday afternoon my copy of Simply Crochet was already waiting for me on my door mat. And this was the free gift. I fell in love immediately. 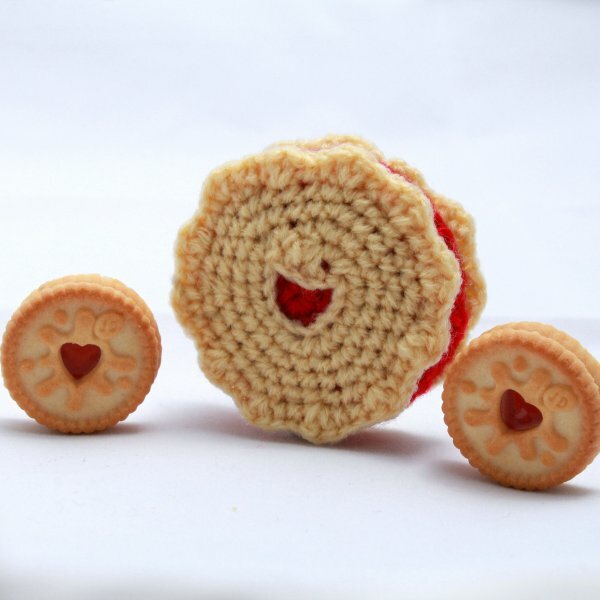 So I dropped everything, grabbed a cup of tea and some Jammy Dodgers and got to work. I did have a few little snags whilst making this. The most obvious being with thd heart in the middle. I use the term heart loosely as what I achieved was a vaguely triangular blob. 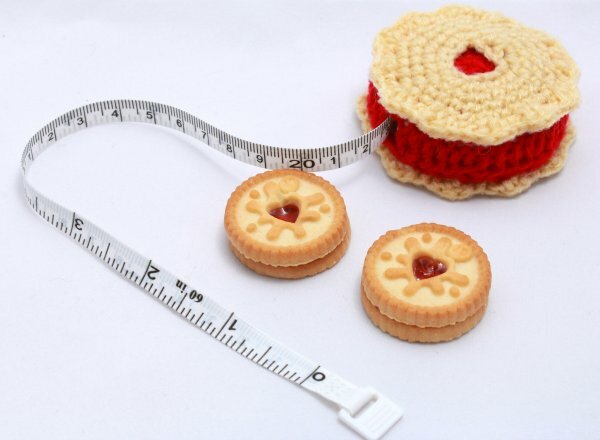 The other issue I had was with tension – When I reached the final row of the jammy center circle, it was nowhere near big enough to fit over the tape measure casing. So I had to crochet another row before I could start the back loop doubles. After a tense game of yarn chicken, I did just about manage to complete the jammy center but even with the extra row and the subsequent extra dc stitches it was still a bit of a stretch. Having said that, it is still very lovely. And I hope to be able to use it for many yeads to come. I have already had a request for one from my Nan, so I now need to find somewhere to purchase the tape msasure bases. Did you give this a go yet? What did you think? Ps. I hust realised how far behind I am on reading your wonderful blogs! Jeepers! Ever so sorry I havent popped by recently. I am going to try to catch up on my night shift tonight. So, as is customary at this time of year, I though a bit of reflection was in order. Sometimes its good to take stock of what you habe acheived. The first reflection is of my crocheting over the year. My first completed project of 2017 was this dinosaur scoodie. I actually started this back in august 2015 so was very pleased to complete it finally. I gifted it to my cousin for his 10th birthday – and according to his mum he loved it – he couldn’t wait to get to school to show his mates! Then there are these cute little book marks I made back in February. You can find the patterns here and here. The next project I completed was my Christmas GSE blanket. Another one that had been on the pile for a while – Since april of 2015. But I stitched the last stitch and sewed in the last end of March 2017. Then it was time for a little pile of baby gifts. A rainbow blanket for little baby Harley, and a fluffy blanket and matching hat for little baby Elkhana. I finished these all in April of 2017. I then made these adorable sandles to take with me on my holidays back in May. 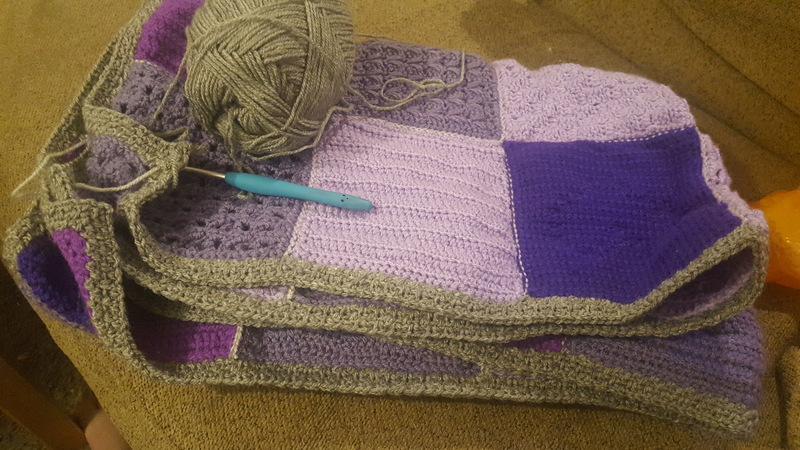 I then got on with a couple of blankets for battersea dog and cat home, also both finished in May. I then moved on to this Ami Octo. Completed in July. You can find the pattern here. And another doggy blanket also completed in July. As well as this tiny octo, crocheted at thr request of my kitty. You can find the pattern here. I then made my first ever Shawl. This lovely shawl was madd with another of my Caron Cakes. You can find the pattern here. I finished this is August. I then moved onto this lovely matching hat and scarf combo. You can find the patterns here and here. 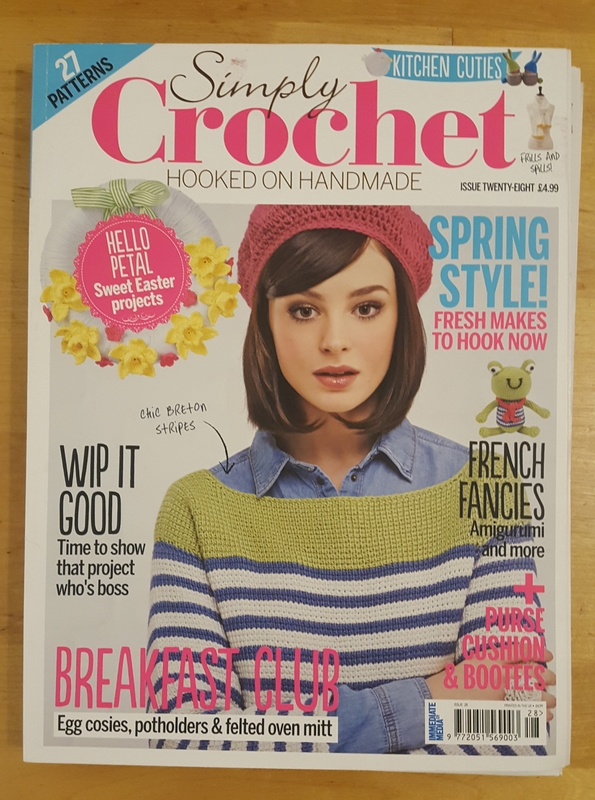 I also started chipping away at my pile of little projects free from the front of my Simply Crochet magazines. I love the little cactus the most! I then didnt finish anything for a while. I started on a few larger projects. The next thing I finished was this hat and mitten set, just in time for bonfire night. You can find the patterns here and here. Then there are the things I am working on still. These three I hope to have completed by the end of the year. A wreath, A Jumper and My Last Dance on the Beach Blanket. 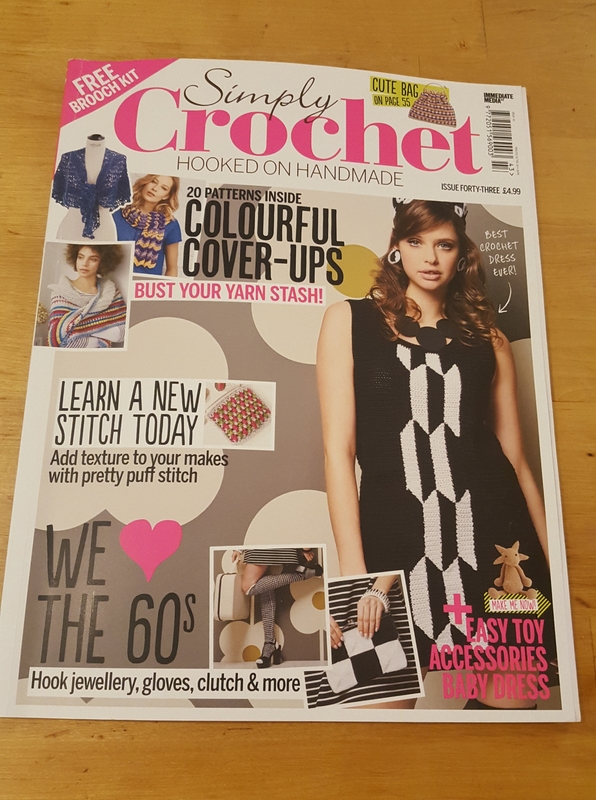 Another edition of Simply Crochet Saturday. 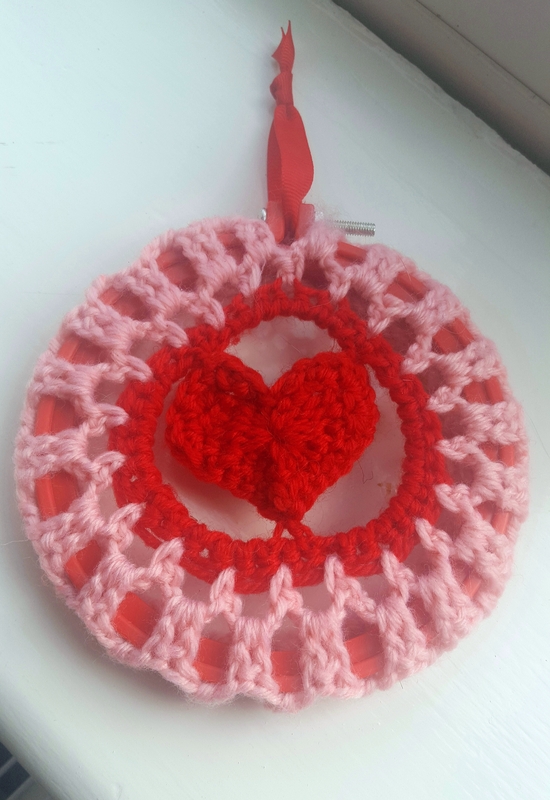 I am pleased to share with you this hanging heart hoop. It came as the free gift on issue 40. You can find it here on ravelry. This is a cute little project but boy is it fiddly. I particularly struggles getting the second part of the hoop in. It just kept popping out. But I couldnt seem to get it to stay for love nor money. I also found it real difficult to tighten the screw as the yarn got in the way. I also had to modify it a bit from the original. Mainly in jostling about the number of chains at the beginning of the red circle. 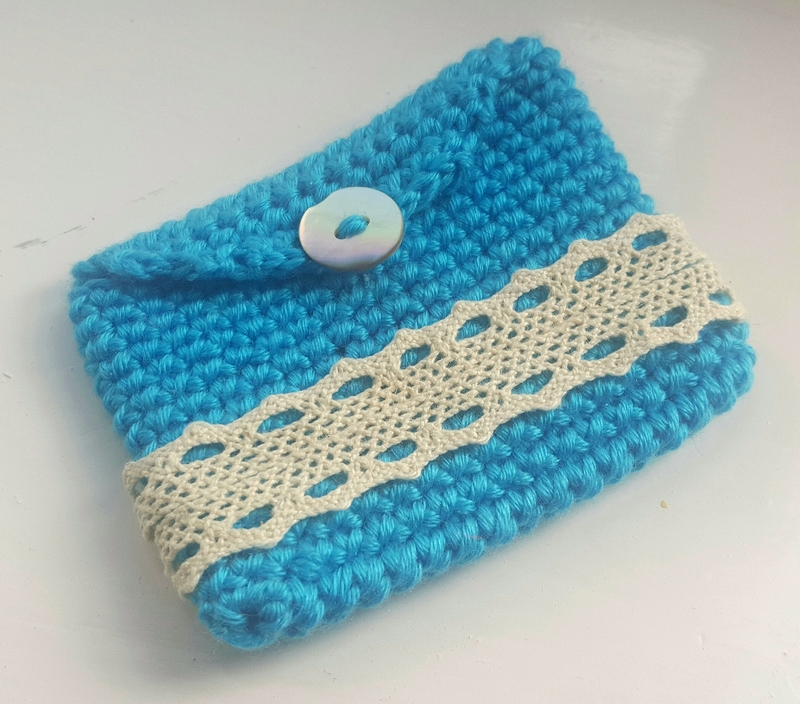 Todays Simply Crochet Saturday post goes to this adorable little coin purse. It came as the free gift on issue twenty eight (one of the first in my collection). You can find it here on ravelry. 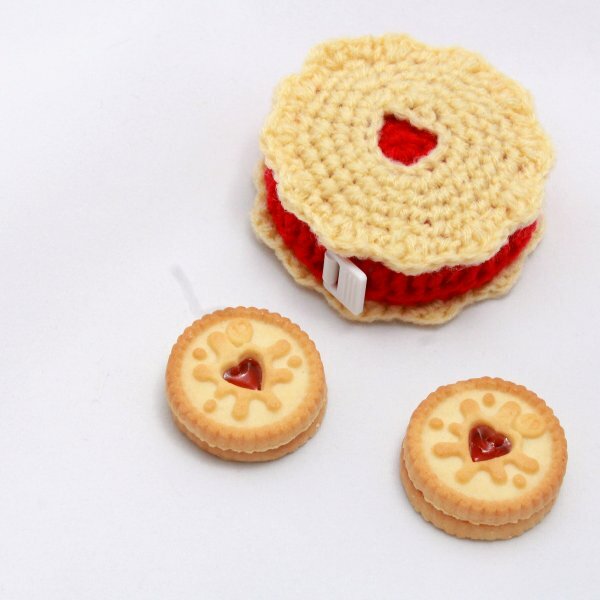 I think this is a sweet little pattern and the yarn supplied was lovely. Such a pretty colour and sheen. The pattern was easy to follow. My main criticism however is that the yarn came up short. I was a good meter or two short of being able to finish it completely. 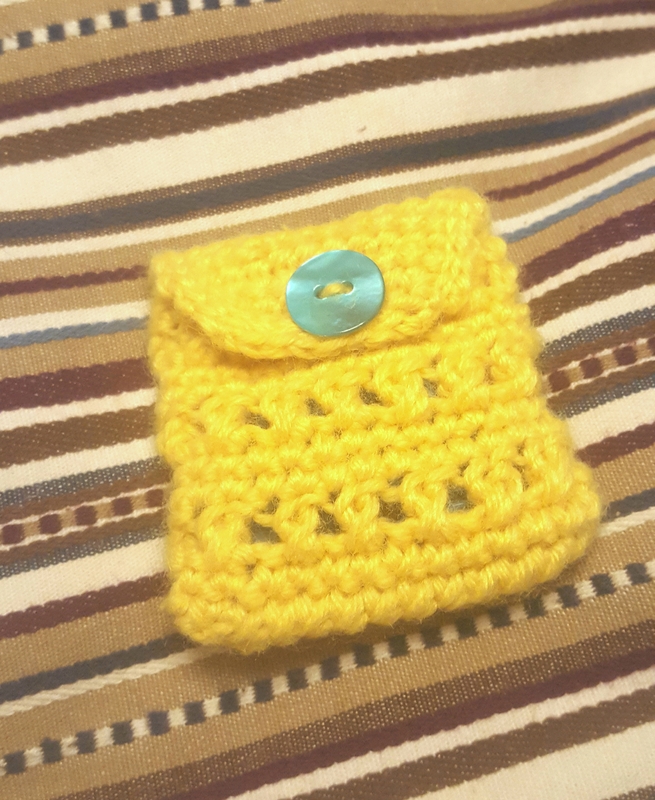 I had to omit the last 5 rows of the button flap as I didnt have enough yarn. Its still sweet, but its not quite as nice looking as it should have been. Oh well, these things happen. I did however get more than double the ribbon I needed, so to fill the gap left by the shortness of the button flap I added an extra row of ribbon. Balances it out quite nicely. This weekend I am away on a jolly to liverpool to celebrate my birthday! (Its not until 28th of October but I am working nights that week and the way that my rota works out means I have no free weekends either side of my birthday, so we are celebrating early!) 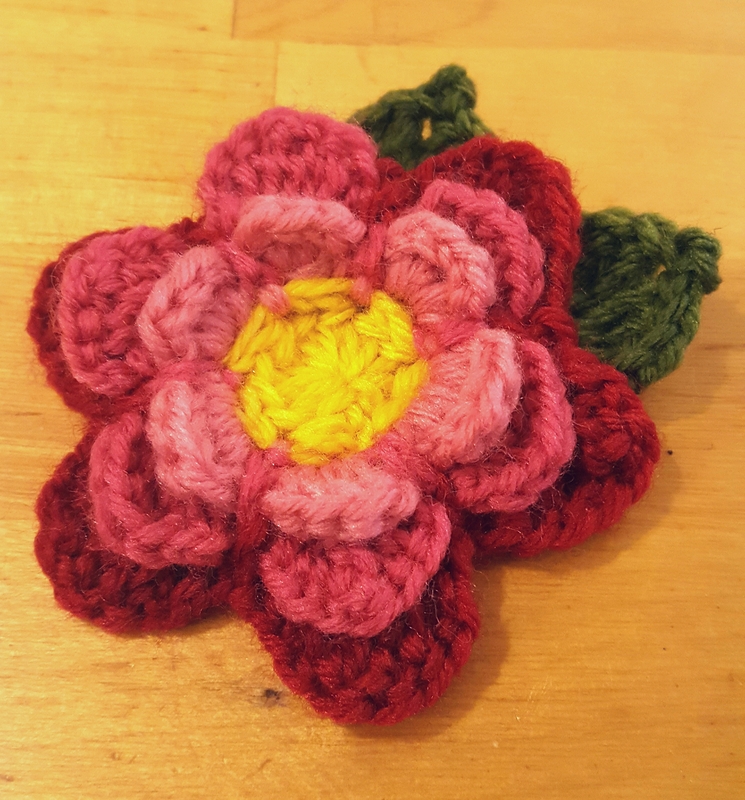 So, Today I am only quickly popping in sharing with you this adorable little flower brooch. It featured as the free gift in issue 43 of thr magazine. You can find it here on ravelry. I really enjoyed this little flower brooch. 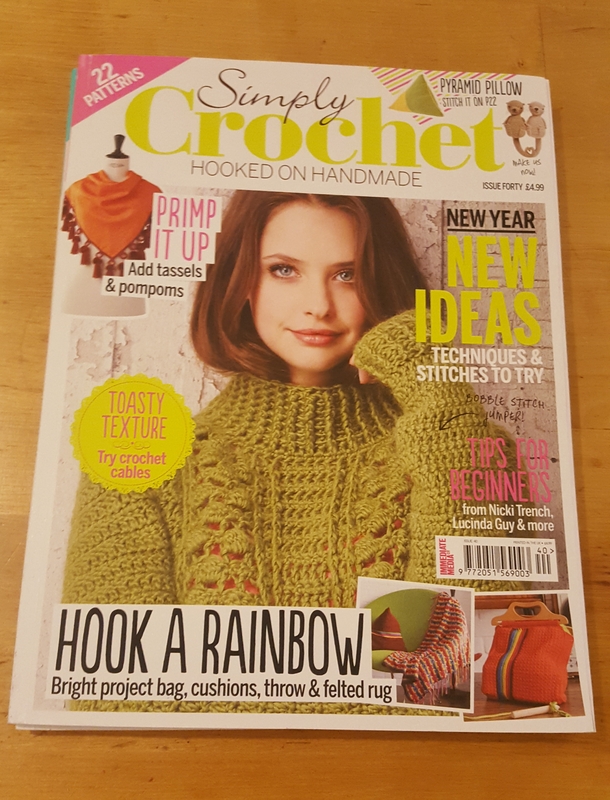 I did initially struggle with the parts where you have to single crochet around the posts of another single crochet. But I managed it in the end. The colours are lovely and for free acrylic its not actually that bad! Isnt it getting nippy at the mo! I am on night shifts right now and I am genuinely contemplating digging out my thermals! Having said that, this cold does make me happy. I love it when the weather starts to turn because its a perfect time for jumpers and mittens and spiced drinks and on course its the start of the run up to christmas to me! Why, I plan to start crafting and writing for my christmas craft series very soon (keep your eyes peeled)! 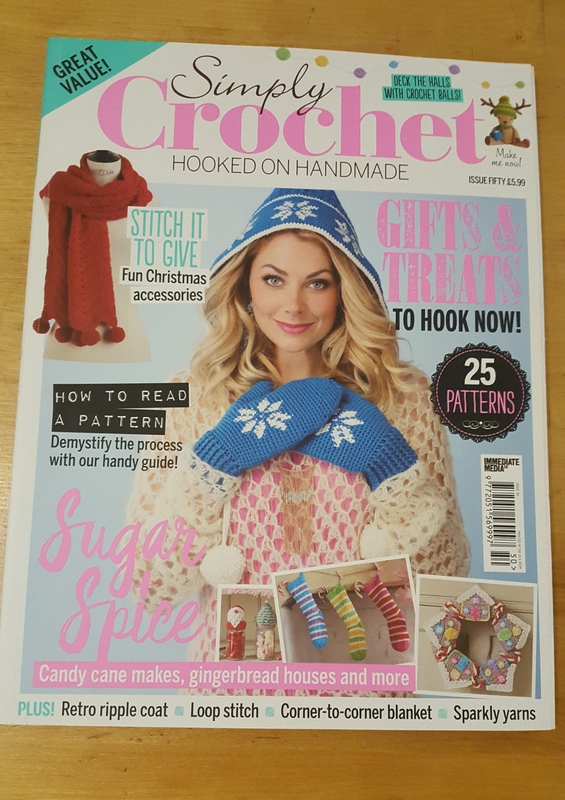 So I think its only fitting that this weeks Simply Crochet Saturday should be on a festive theme. 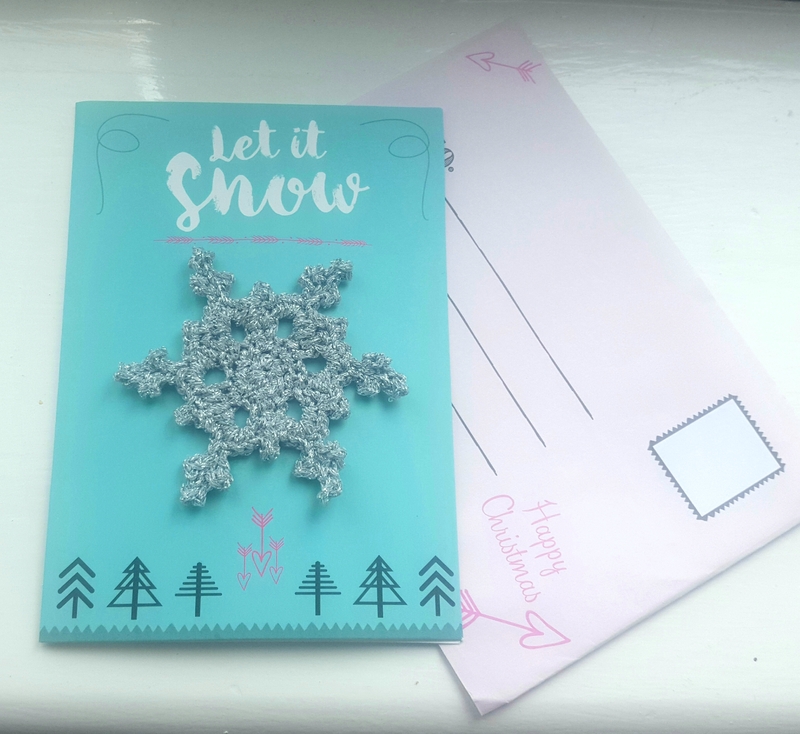 This is the Festive Flurry snowflake christmas kit which came in issue 50 of the magazine. You can find it here on ravelry. I enjoyed making this pattern. The yarn (like many mettallics) was a little hard to work with but I can definately see myself working this pattern again! Maybe it will feature on some of my christmas cards this year! Who knows? We shall see! Today I am popping in to share with you this ‘Just a Little’ notions purse. It is from issue 57. You can find it here on ravelry. This is a very quick little project. It only took me about 30 minutes. I think it would make a great gift for another crafter in your life. I did struggle a little bit with it being in the round though, so I ended up just slip stitching into the first stitch from the previous round and chaining 1 before starting the next round. I do love the lovely sunny yellow colour!